All this and more, right here in Tyler, Texas-- Pioneering solutions for the future. Biotechnology is an emerging field worldwide and Tyler will be at the forefront of it. Boasting several of Texas’ leading universities and hospitals, the scene has already been set for this industry. Add distinguished faculty and doctors from the prestigious UT Tyler system and it’s easy to see that Tyler is ripe for a biotechnology boom, not only in Texas, but throughout the world. Already at the forefront of innovative technologies, Tyler will soon begin a new chapter in its breakthrough scientific chronicle: biotechnology. Construction is set to begin shortly on a multimillion dollar Biomedical Research Park. Tenants would include those from academia, medicine, pharmaceuticals, bioengineering corporations, and more as the Park will serve as a hub for leading research in the fields of biological technologies and sciences, allergy and asthma respiratory health, fetal and neo-natal preventative and emergency care, and much more. The Biomedical Research Park is located immediately north and adjacent to The University of Texas Health Science Center at Tyler (UTHCT) , which employs approximately 1,300 people and includes research departments in biochemistry, cell biology, epidemiology and biomathematics, microbiology, molecular biology and occupational health services. Among other programs, the institution offers graduate programs in biotechnology and environmental sciences. The Center also has a research and development facility directly related to biotechnology disciplines. The Biomedical Research Park is also strategically located in East Texas, near Dallas, Houston, and Austin. This location allows for the collaborative efforts of several of University of Texas’ finest schools to engage in high level research of tomorrow’s health and biological solutions. A distinctive feature of this planned development is the inclusion of a business and research incubator. This incubator will help startup companies commercialize their biotech innovations. The center is synergistically progressing thanks to a partnership between several companies in and outside of East Texas, The University of Texas at Tyler, UTHCT, and others in the field. Sponsorships have already been discussed with companies such as Carrier and Trane, the University of Texas system, and others and could be the future home of Texas Allergy, Indoor Environment and Energy (TxAIRE) Institute research headquarters, an organization creating its own market niche in respiratory health, namely combating allergies and asthma. 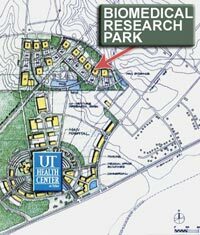 In 2009, UTHSCT broke ground on a new $67 million, 85,500 square foot academic center that will provide space and resources to train family practice physicians. Phase I was completed November 2011. Phase II, which is estimated to cost about $25 millions to complete, will finish the second and third floors of the building, to include the Chamblee Cancer Treatment and Research Center, a family medicine clinic and space for the Family Medicine Residency Program. Funding for the center stems from tuition revenue bonds, local institutional funds from patient care revenue and philanthropic support. Each year, UTHSCT trains 24 residents in its three-year family medicine residency program. The program has graduated 132 physicians since 1985 and more than half have remained in East Texas; 34 graduates practice family and occupational medicine in the Tyler area today. Please contact us to inquire about forging partnerships, to reserve research and office space, or to learn about how Tyler is getting ready to be a global leader of biotechnology research. We’re creating the breakthroughs of tomorrow, today— will you join us?